Too busy for the brow lady? Use these simple steps to take care of your own brows yourself! There’s nothing worse than getting a fresh bang trim, then immediately looking in the mirror and realizing that your eyebrows are a total mess. Before you shame yourself for ignoring such an important part of your beauty routine, cut yourself some slack. You can take simple precautions to make sure your brow game is under control, no matter what your calendar looks like. Rectify your brow game so it’s always on point— at home! First things first, using a makeup brush as a ruler (or any other straight edge), measure a straight line from the edge of your nostril up to the inner corner of your eye and up to the eyebrow. This is where your brow should start. Next, measure a line from the same edge of your nostril to the outer corner of the same eye. This will be where your brow ends. 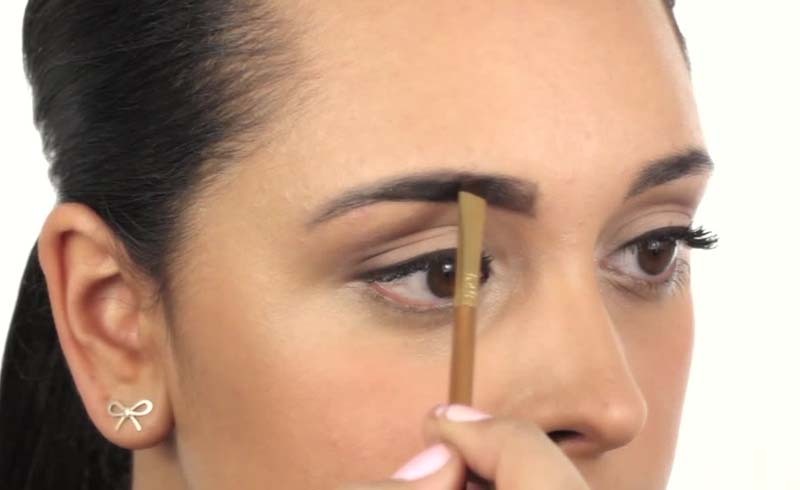 To create the perfect arch, fake it with a brow stencil! With five shapes to choose from, Anastasia’s Stencils are the ideal tool for this. Complete the look by using a duo kit like Nudestix Eyebrow Stylus Pencil Gel. The angled, easy-to-use pencil is available in four different shades, and comes with a waterproof stay-put gel and spoolie to help you achieve the arch of your dreams. After using the stencil to figure out where your arch should be, you can clean up any excess hairs with a tweezer, like the Purple Reign Petite Tweeze Set from Tweezerman. Use Anastasia’s After Tweeze Cream to dull down any redness. A kit like Tweezerman’s Brow Shaping Scissors Brush will help maintain the length of your brow hairs. Use the mini spoolie brush to comb your eyebrow hairs up. The hairs that stick out above your line can be trimmed with the scissors. After filling in your brows with a pencil or powder, make sure your hairs stay in place. You don’t want your hard work getting undone so quickly! Dab some of the Nudestix Brow Gel from their Eyebrow Stylus Pencil Gel on your brows to settle down any unruly hairs. Don’t you feel more relaxed now?